I’ve been holding out on you and I’m SORRY! 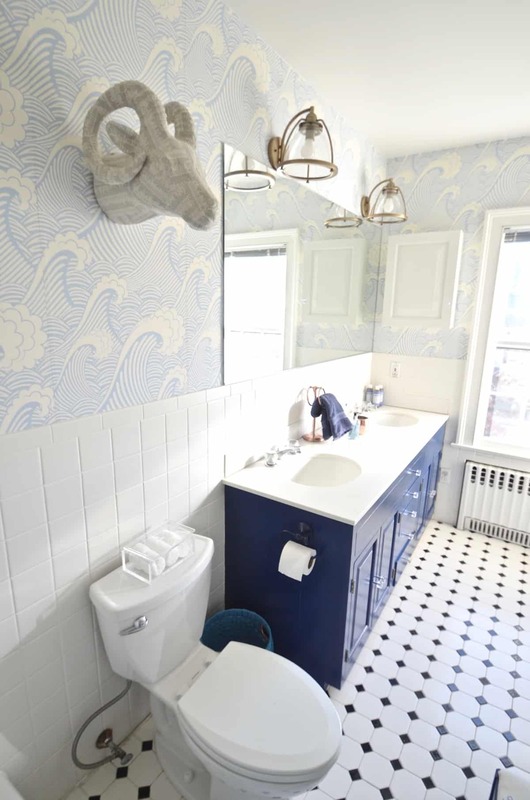 I know I said this bathroom refresh would be on the blog much sooner, but… I blame turkey and black Friday. A month or so ago, I shared a vision board for the kids bathroom and pretty quickly got around to painting the vanity but I left it there. Until today! Disclosure: I reached out to three amazing brands for this post… because I love them. And thankfully I was able to work with WallsNeedLove , LampsPlus and World Market to help make that little vision board above a reality. There may be some affiliate links to the products used included in this post. 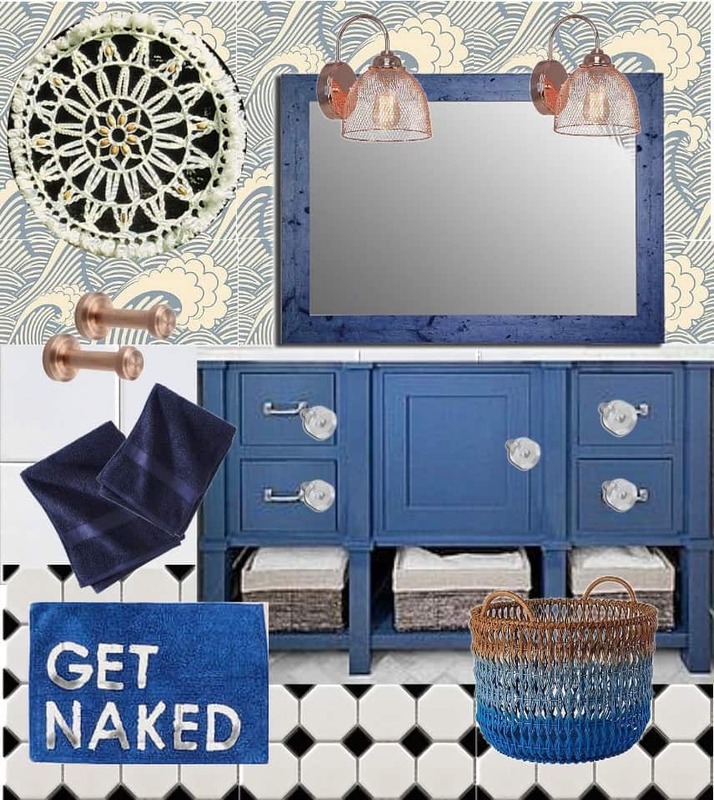 Then… a little thing called the One Room Challenge interrupted the bathroom progress. It only took a few days to implement the next couple of details for this fun kid’s space and… here it is in all its glory. 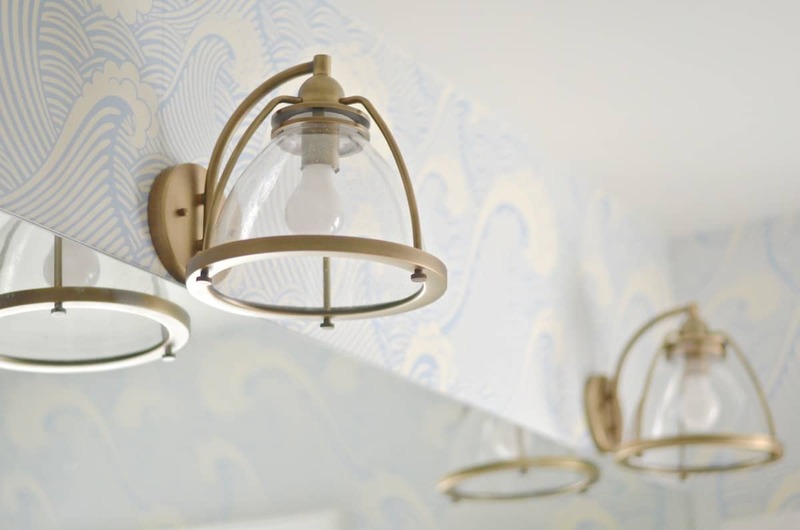 WallsNeedLove sent me their AMAZING Waves of Chic removable wallpaper and LampsPlus completely updated the vanity area thanks to these two AMAZING pendants! I’ll share a tutorial/ tips on the removable wallpaper in a separate post. I LOVE the results, but definitely learned some things after installing it. 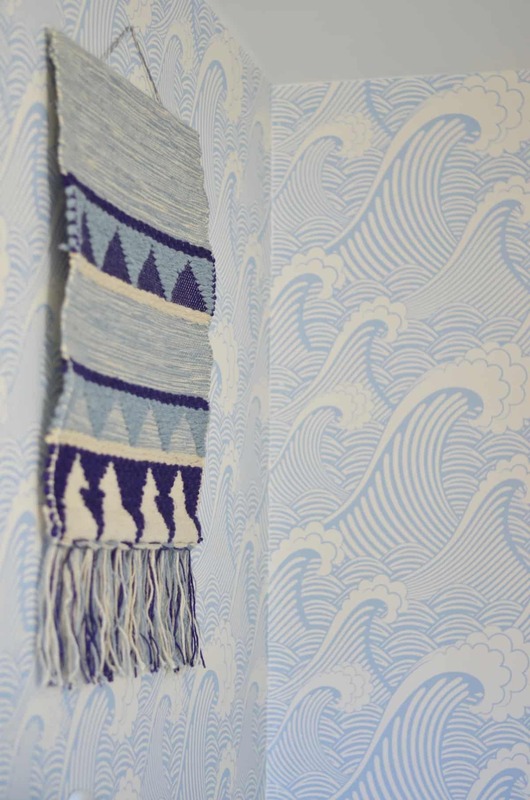 It’s a soft shade of blue that keeps the intricate graphics of the pattern from being too harsh. 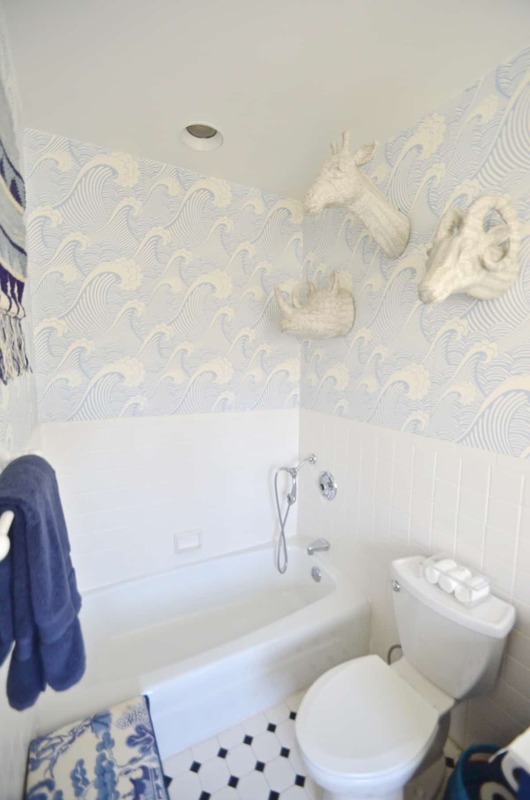 Also… it’s waves and it’s a bathroom so, ya know… that totally works. 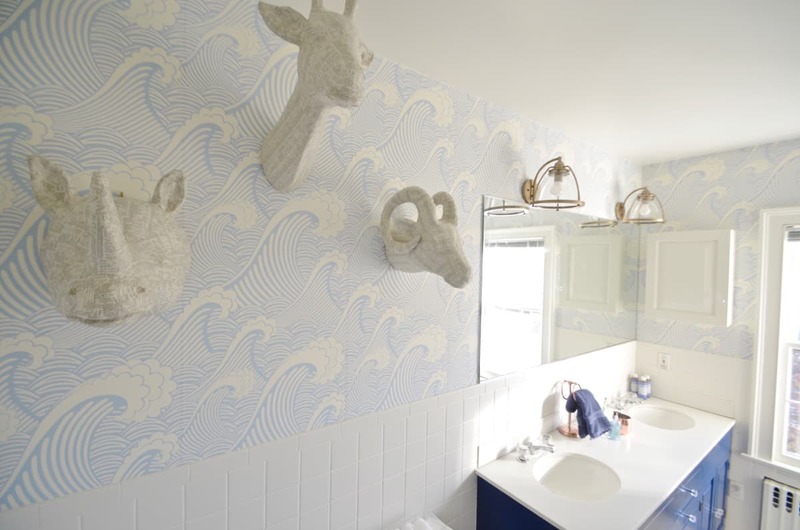 Like I said, it took a little practice to figure out the removable wallpaper, but doesn’t the room look SO much more interesting and fun with the waves? Let’s move on to the new lights, though… because they updated the space way more than I expected. The previous lights were poster children for the 1980s. If you look carefully, you might see a few of those little bracelets that Madonna wore. 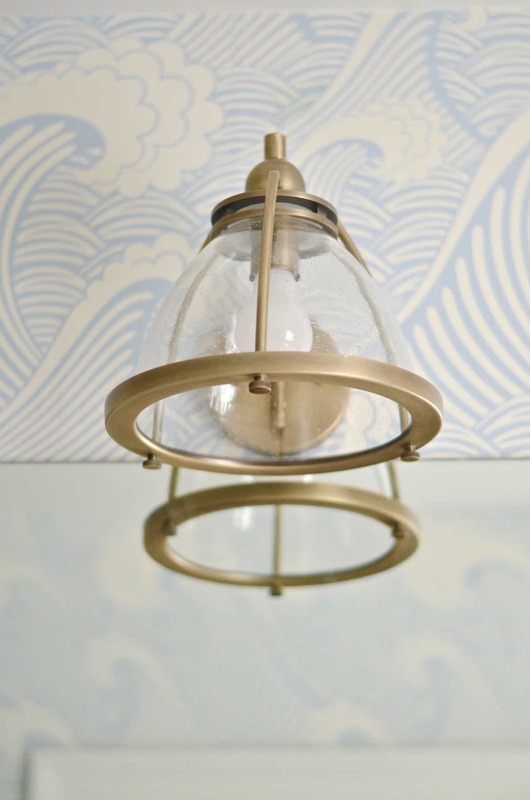 I was able to easily swap out the old lights for these distressed brass sconces. When choosing bathroom lighting, it’s important to pay attention to the wattage of the lights as you want something brighter than 60W ideally. These are just bright enough and I love the new and improved modern look they bring to the room! 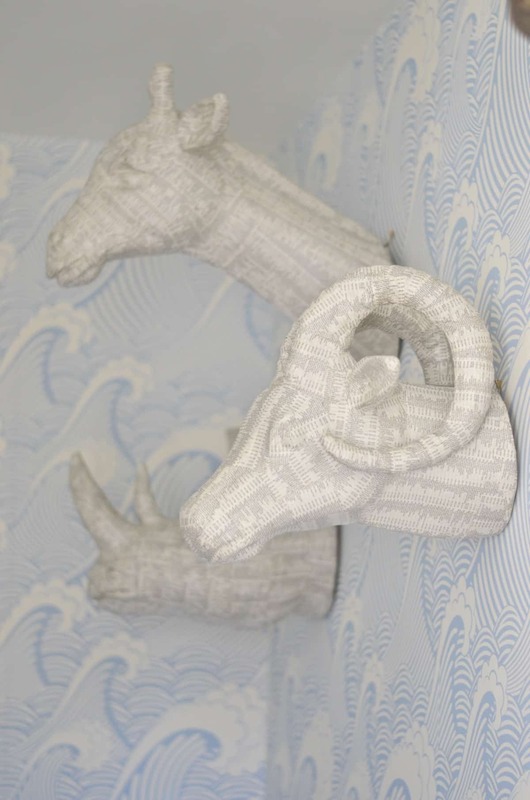 As with any room… the finishing details are what make the space, and these paper mache animal heads from World Market are the best. I asked my Facebook page whether they liked the animals and everyone said yes… so in they came! This is a kids bathroom so what better place to have a little fun, right?! I have one last little detail to bring in here, and then the room will be done! 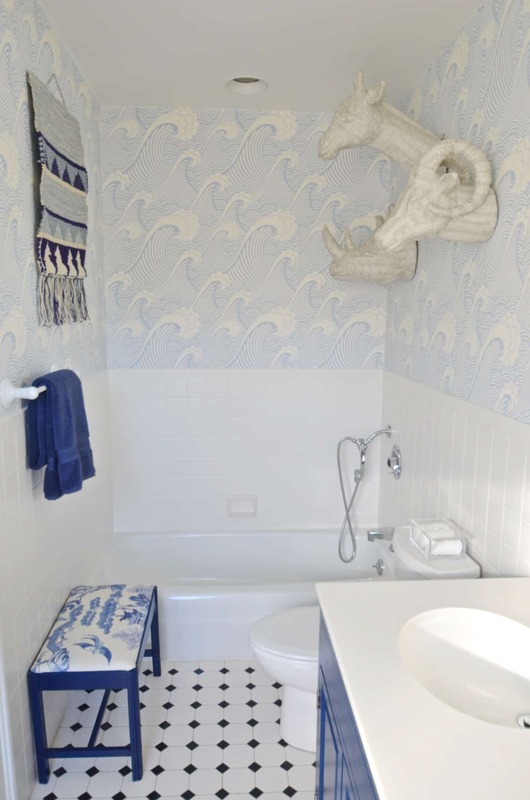 It’s a shame that the kids’ bathroom is so bright and cheery, while ours is still awash in dated floral wallpaper! Baby steps, folks. Baby steps. BIG thanks to Walls Need Love, Lamps Plus and World Market for being so generous and making this bathroom makeover so colorful and playful! 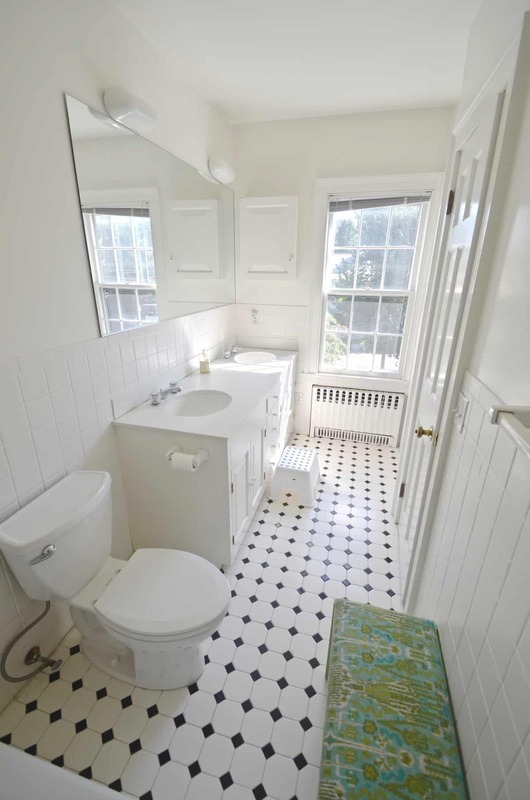 I never realized how fun a bathroom could be to design. 🙂 Ha! Stunning! 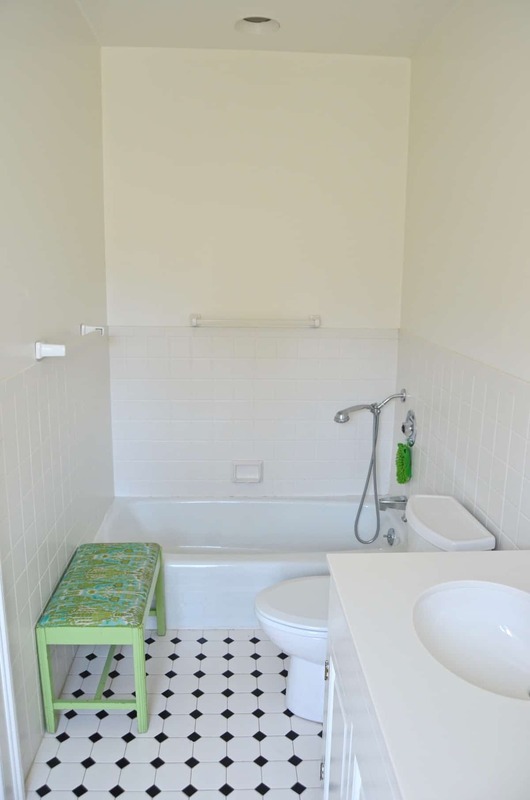 When kiddos get older and want to shower and not take a bath, will you have to renovate this room or is there another bath with shower? How does the wallpaper do with splashed water? 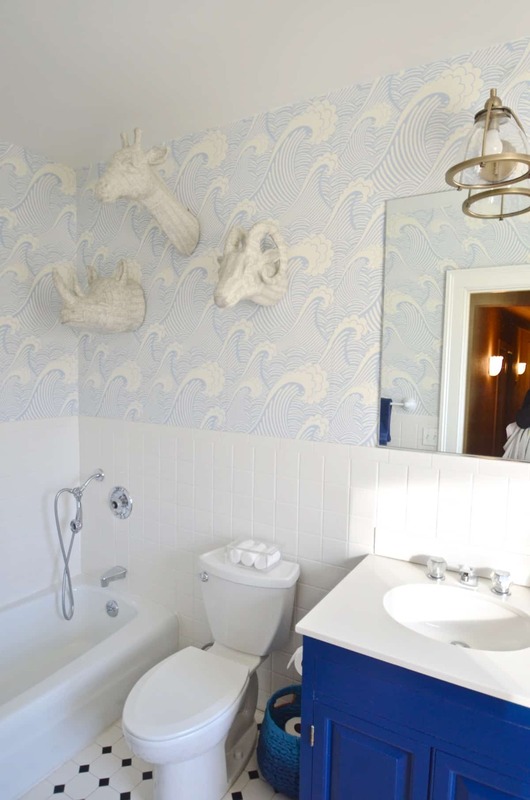 That wallpaper is gorgeous; very ‘The Great Wave off Kanagawa’. Yes! I considered a stencil of just that wave, but when I found this wallpaper… game over. SO pretty! 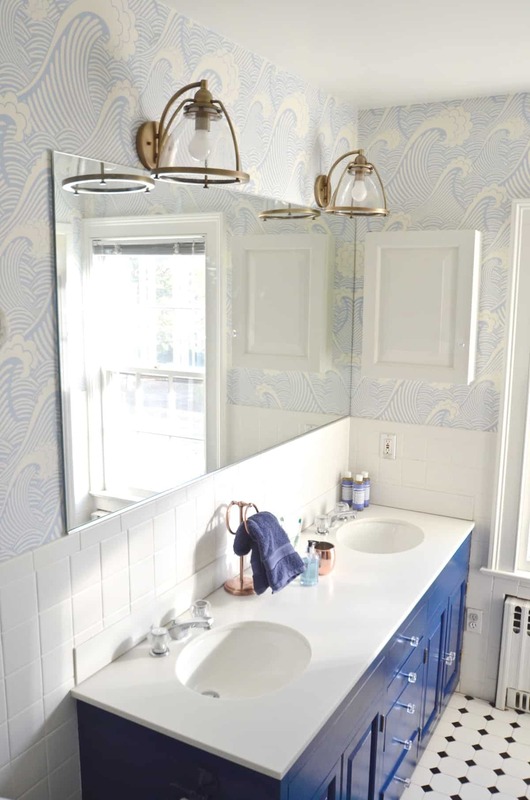 I love the navy sink. The wallpaper is so much fun. I bet the kids love bath time now!